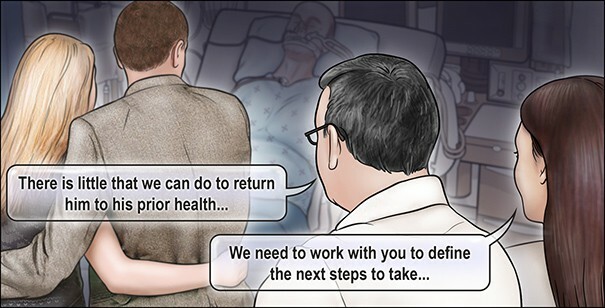 In this instalment of the NEJM’s Critical Care Challenge, the editors turn to the issue of end of life care and ask for your view of how should decisions be made when ongoing treatment is futile. A 77-year-old man whose medical history includes treated hypertension and hypercholesterolemia, previous heavy alcohol intake, and mild cognitive impairment required 15 days of treatment in the ICU for septic shock due to faecal peritonitis from a perforated sigmoid colon. Complications during his ICU stay included ARDS, mild disseminated intravascular coagulation and acute hepatic necrosis. After being transferred to the surgical floor, he had an unwitnessed fall from his bed, and cranial CT showed an acute subdural haematoma with underlying hemorrhagic contusion on the left side and 5-mm displacement of the midline intracranial structures. He was taken to the operating room and underwent a craniotomy for evacuation of the subdural haematoma. Twelve days after this procedure, during which he received no sedative medications, he remains in a coma with a best motor response of abnormal flexion on the left side. He is still receiving mechanical ventilation. The consensus opinion of treating clinicians is that he will most likely not make a functional recovery. Which of the following options would you favour to determine the further treatment of this patient? 1. Meet with the family and tell them there is no hope of recovery and you will be discontinuing mechanical ventilation. 2. Meet with the family with the goal of ascertaining the patient’s wishes regarding the continuation of active medical treatment and whether the likely outcome of continued treatment — at best, placement in a nursing home with a high level of care — would be consistent with the patient’s wishes. 3. Meet with the family and ask them whether they would like the patient to have a tracheostomy. 4. Meet with the family and tell them you will perform a tracheostomy. You can cast your vote here. We’ll bring you the results of this, the final instalment of the series soon.